Not so long ago I discovered a clip from a game-show on the internet. A game-show from Japan – home of everything utterly mad – called Up The Stairs. Knowing from having seen many other Japanese game-shows that this would probably be both awesome and impenetrable, I decided to concentrate hard on this clip and try to make some sense of it. I was right on both counts. Here are seven reasons that Up The Stairs Is Amazing. 1. It Looks Abominably Cruel. They’re sending a little old lady up the stairs. That’s what they’re doing, and the stairs look slippery. And there are men at the top wearing only pants; they don’t look very friendly. She looks particularly doddery, and the stairs look particularly slippery. What manner of fiendishness is this? 2. Oh My God! Now look what’s happened! The old lady’s fallen down the slippery stairs and has plummeted headlong into a pool. There’s an elderly lady drowning! Oh, the indignity! Oh, the horror! Oh, the humanity! 3. Help Is At Hand. But it’s not as cruel as I thought, because at least there are people helping her out. There’s a young woman, an old man, a baseball player, another old woman, a businessman and a dustman(?). What the hell are they all doing there? Is this the Japanese version of the Village People? And now the plucky old girl’s having another go! Now she’s running back up the stairs! No…she’s plummeting down the stairs and headlong into the pool again. But undeterred, she’s getting up again, a little breathlessly. But now something amazing’s happening. In a brilliant show of teamwork and solidarity, some other members of the Village People are going up the stairs with her. Now the old lady, the old man, the businessman and the baseball player are storming up the stairs. But the men in pants are hurling water-balloons at them! They score a direct hit on the old lady! She’s skidding down the stairs again. And oh, no! Her dress has come open. Aaaarrggghh!!!! 4. Wait! Thank God! That’s No Old Lady! That’s a younger man dressed as an old lady. I’ve seldom been this relieved to discover that a woman is, in fact, a man dressed as a woman. If ever. The charge up the stairs isn’t going well though. The businessman (who could well be an old lady dressed as a businessman. It’s that weird) soon follows the old lady in her descent down the slippery staircase, immediately followed by the old man (awesome direct hit by balloon to face)and the baseball player (hit on the hand, making him look like a bit of a banana). But then something truly amazing happens. 6. 3:41. Interrobang! An interrobang! 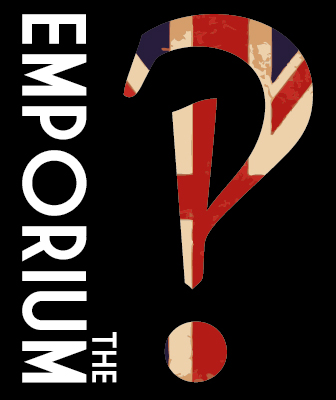 IT’S AN INTERROBANG! 7. Wait! How Does It Work Then? The man-in-his-pants has reached the top with his red stuffed cuboid. He raises it above his head. He roars. Everyone applauds. He roars some more. He seems to like roaring. Then, with his red stuffed cuboid still held above his head, the apparently triumphant man-in-his-pants begins – cautiously – to descend the slippery stairs. Then – somewhat predictably – after a couple of wobbles he loses his footing and slides to the bottom, followed by his red stuffed cuboid. Then everyone laughs at him. Then the dustman makes some sort of pronouncement. Then everyone cheers and some men in pants wave. I don’t know what the hell just happened there, but it was amazing. Amazing. Seriously, any ideas?